A natural resin is a viscous secretion produced by certain plants when they're wounded. The liquid resin oozes over the wound and usually hardens over time, acting as a sealant that protects the plant from infection, attack by herbivores, and water loss. Plant resins are useful for plants and are often helpful for humans, too. 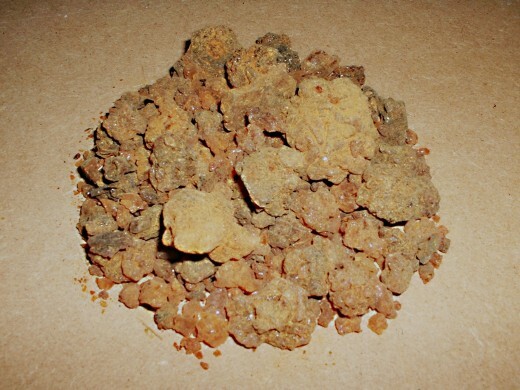 Resins such as frankincense and myrrh have a lovely fragrance and are used in perfumes and incense. Some resins, including both frankincense and myrrh, seem to have medicinal or antiseptic properties. Amber is an ancient, fossilized resin that sometimes contains the preserved bodies of small creatures, such as insects. Millions of years ago, these creatures were trapped in the resin when it was in its liquid form. Their bodies became incorporated into the solid amber. Amber is admired for its beautiful appearance and is also used in jewelry. Plant resins are made by glands that line resin ducts and are secreted into cavities. They're generally made by woody plants rather than non-woody ones and can be harvested by deliberately injuring or "tapping" tree trunks. In some plants, flowers or buds secrete resin. Biologists use three general categories to classify plant resins. Hard resins contain no oil or only a tiny amount. As they solidify, they become a hard substance that has a high degree of transparency. Amber and natural lacquer are hard resins. Oleoresins contain so much oil that they may remain liquid once they're secreted. As a liquid, they have a viscosity resembling honey. If they do solidify, the solid is very soft and breaks easily. Turpentines and balsams are oleoresins. Gum resins are solid mixtures of resin and gum. 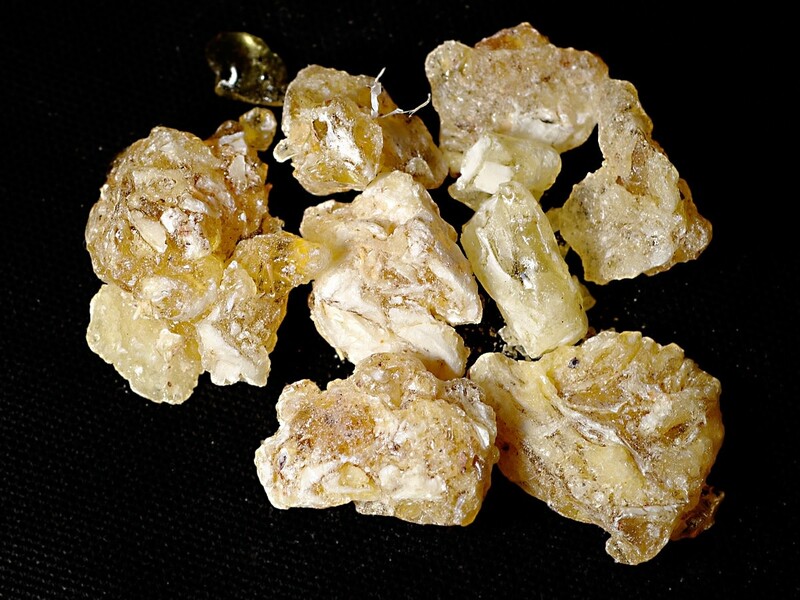 Frankincense and myrrh are gum resins. Frankincense is a gum resin produced by trees in the genus Boswellia, especially Boswellia sacra. Boswellia is a shrubby tree found in Africa, India, and the Middle East. It generally grows in rocky areas with dry soil. The tree's resin is usually pale yellow in color and has a pleasant scent. The resin is also known as olibanum and is popular in the perfume industry. It's used as incense because when it burns it releases a fragrant smoke. In fact, its name is derived from the Old French "franc encens", which means "pure or high quality incense". The incense is lit in religious ceremonies, used during meditation or aromatherapy, or simply lit for pleasure. 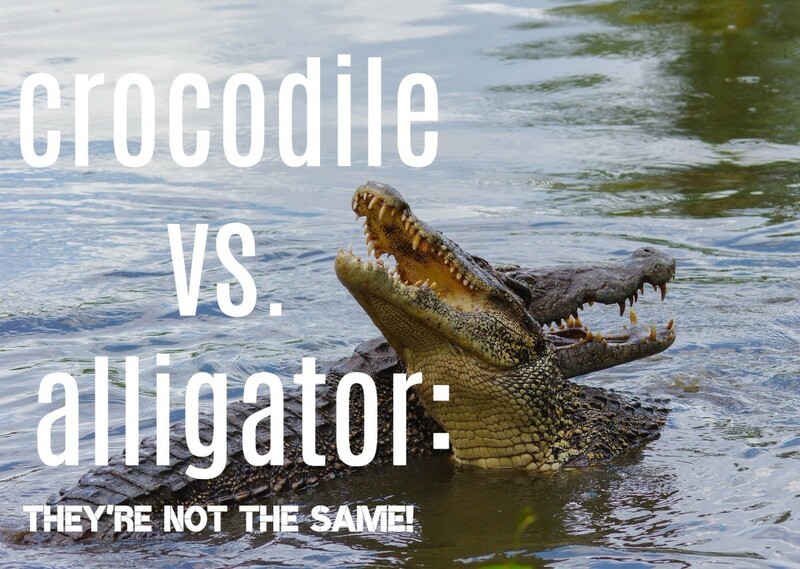 It's sometimes used as an insect repellent and an air freshener. Frankincense has been popular as an incense for thousands of years and was used in Ancient Egypt, Greece, and Rome. It's mentioned in the Bible as one of the three gifts of the wise men to the baby Jesus, along with myrrh and gold. Pure, uncontaminated frankincense is edible and can be chewed like gum, although it has a stickier texture than modern chewing gum. An oil can be extracted from the resin. The resin, the oil, and the Boswellia plant are said to have many health benefits. The medicinal effects of frankincense or Boswellia haven't been confirmed by scientists, but there have been some intriguing preliminary discoveries. In one set of experiments, both capsules of frankincense and an extract from Boswellia called 5-Loxin significantly improved the pain caused by osteoarthritis of the knee. Another experiment showed that frankincense oil destroyed bladder cancer cells in lab equipment without harming normal bladder cells. This doesn't necessarily mean that it will be helpful for bladder cancer inside the human body, however. Myrrh is produced by trees in the Commiphora genus, especially Commiphora myrrha, which grows in Africa, Saudi Arabia, and Oman. The tree has spiny branches and small leaves. The resin is yellow to red-brown in color and is aromatic. It contains oil and is used in perfumes and incense. Myrrh is harvested like frankincense. A cut is made in the tree trunk, which stimulates the release of liquid resin. The resin drips down the tree trunk, forming "tears", which are collected when they have partially hardened. In addition to providing a lovely scent, myrrh seems to have antiseptic properties. It's added to oral hygiene products such as toothpastes and mouthwash. In the past it was added to embalming mixtures to preserve dead bodies. 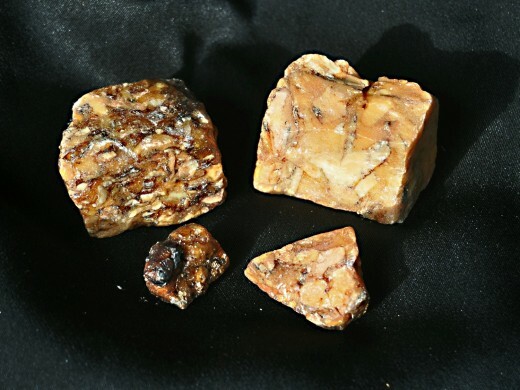 As is the case for frankincense, there are many unproven health claims for myrrh. Although frankincense is generally considered to be safe when ingested in small amounts, there are far more concerns about the safety of ingesting myrrh. Myrrh may stimulate the uterus to contract, which could be dangerous during pregnancy. It may also lower blood sugar, which might be harmful for someone taking diabetes medication. In addition, high doses of myrrh may affect the heart rate. Amber is a tree resin that has become fossilized. It often has a beautiful golden color and is commonly used in jewelry. 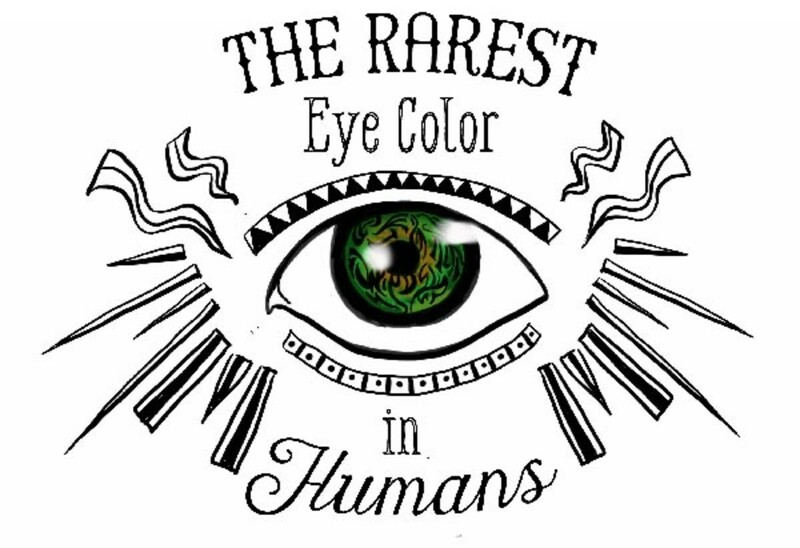 It may also be green, blue, red, brown, or black. Evidence suggests that trade in amber began in the Stone Age. Amber has another claim to fame in addition to its lovely appearance. It sometimes contains inclusions, such as the bodies of dead insects. It's fascinating to look at an insect or other animal trapped inside amber. The animal's body is often preserved in exquisite detail. The preservation of an insect in amber begins when the insect becomes stuck in a sticky resin oozing from a tree and dies. If the resin completely engulfs the insect it preserves the insect's body. Volatile components of the resin (those that escape as a gas) are slowly released. After many thousands of years the resin is transformed into a hard but still slightly gummy material called copal. If it's left undisturbed, copal eventually turns into amber, which is completely hard and is said to be "fossilized" resin. Some insects preserved in amber date from the time of the dinosaurs, which became extinct about 65 million years ago. 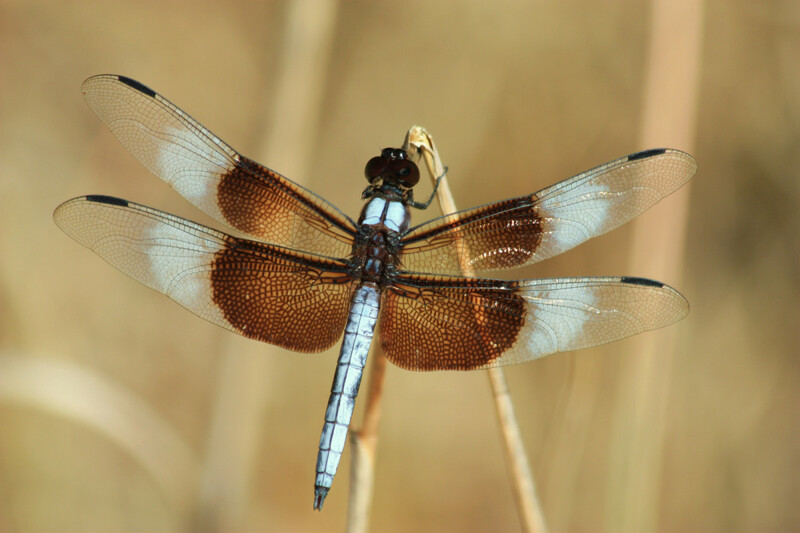 For a long time, it's been hoped that some of the insects fed on dinosaur blood and that scientists would discover dinosaur DNA fragments in the insects' bodies. This idea provided the background for the creation of the dinosaurs in the first Jurassic Park movie. 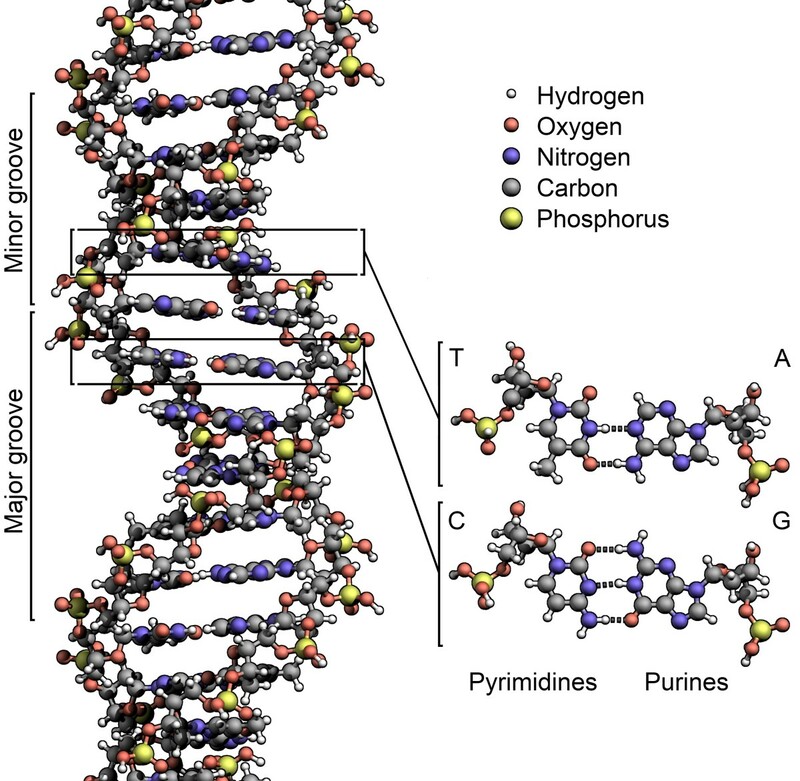 DNA is a chemical that contains the genetic code. This code contains the instructions for making an organism. We have the ability to insert DNA from one creature into the egg cell of another creature, replacing the egg's own DNA. When the egg develops, the baby that is born will have some or all of the characteristics of the DNA donor, depending on how much DNA has been replaced. 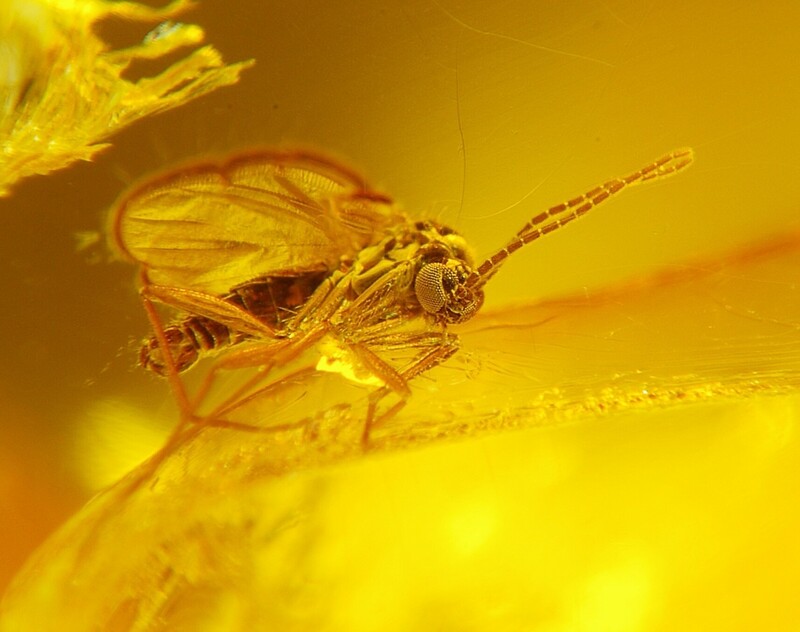 Since insect bodies are preserved in such wonderful condition inside amber, scientists had hoped that the DNA inside them would have survived, too. Surviving dinosaur DNA could be studied and perhaps even transferred into a modern reptile egg or into the egg of an animal believed to be the closest living relative of the dinosaur. If all went according to plan, the infant would exhibit some of the characteristics of the dinosaur. Unfortunately, DNA from such ancient times has not yet been discovered. 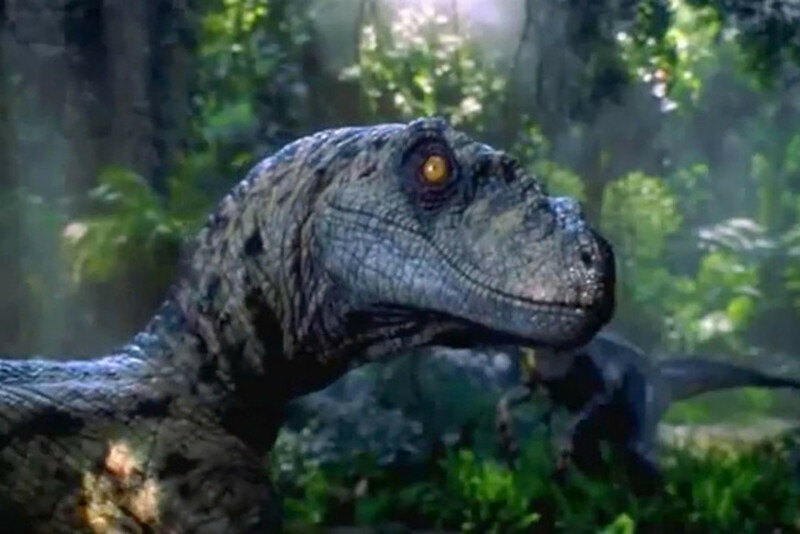 If it's ever possible, do you think we should bring back a dinosaur from extinction? Yes, I love this idea! Perhaps - it depends on what type of dinosaur is brought back. No, this should never be done. DNA is a delicate substance and breaks down quickly after an organism dies. DNA of organisms that became extinct relatively recently has survived under special circumstances, however. For example, mammoths found in cold and icy environments sometimes contain intact pieces of DNA. The low temperatures surrounding the mammoth bodies helped to preserve the DNA. 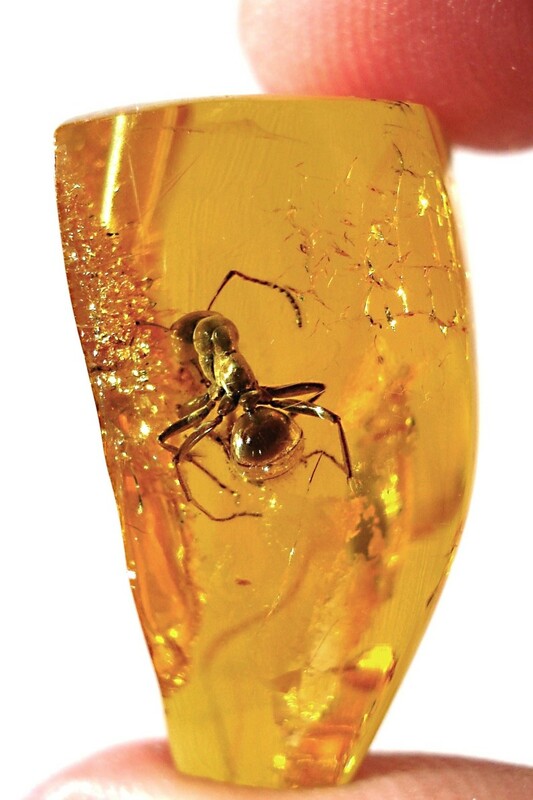 In the 1990s several different scientists claimed that they had found dinosaur DNA in insects preserved in amber. 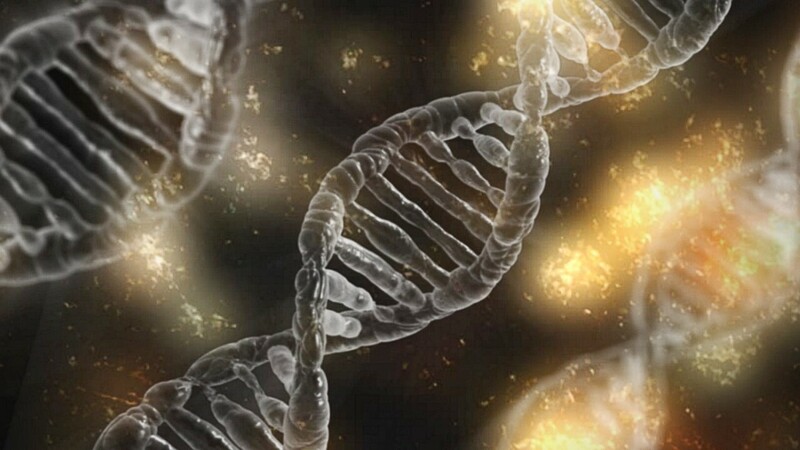 Recently, however, scientists from the University of Manchester in the United Kingdom have concluded that this research involved contamination of the samples with modern DNA. After following meticulous experimental conditions and using procedures that were designed to prevent any contamination of the samples, the scientists found no convincing evidence of ancient DNA in copal, the forerunner of amber. Some DNA was found, but it was in the form of tiny fragments and is believed to be relatively modern. The copal that exists today was created from resin that was secreted long after dinosaurs disappeared from the earth. Since the copal that the scientists tested contained no ancient DNA, they say that they have "doubts " that ancient DNA can be found in amber, which is millions of years older than copal. Many other plant resins are used by humans. Turpentines are oleoresins produced by conifers. The resin forms a soft, sticky substance that is sometimes known as pitch. The resin can be distilled to produce oil of turpentine. Balsams are oleoresins that contain benzoic acid and/ or cinnamic acid, which gives them a lovely fragrance. Canada balsam is produced by the balsam fir tree and is classified as a turpentine, despite its name. This is an example of how confusing the classification system can be. Lacquer is a hard resin produced by the Chinese lacquer tree, also known as the varnish tree. A red resin secreted by the tiny lac insect is also known as lacquer, or as shellac. The list of resins in current use is very long. The fact that some plant resins are useful and appear to be beneficial for our health is one reason why it's important to help plant life survive on Earth. New medicines that can treat health problems or even save lives may be hiding in plants. What's the best way to dry fresh amber out to harden it? Amber is a fossilized plant resin that takes millions of years to form and requires special conditions. It’s not something that we can make ourselves. Some soft plant resins that we observe in nature today may naturally become a solid within weeks, months, or years, however, depending on the type of resin. The process generally takes a long time. I have no experience in drying a plant resin artificially and can’t recommend a safe or efficient way to do this. If you can find an undisturbed tree that is exuding resin, it’s interesting to observe the natural hardening process, though. I’ve done this with a tree in my garden. When exposed to the air, how long does it take liquid myrrh to set? I've never collected myrrh myself, so I have no experience with the hardening process. Based on what I've read, though, the process seems to be quite rapid. One seemingly reliable source says the process requires "days", and another says that the hardened myrrh is collected after two weeks. Hi, Pat. The best person to tell you about an amber inclusion would be a scientist who studies amber or the life forms present at the time when the amber was formed. Perhaps you could find a scientist at a local college or university. If this isn't possible, you may be able to email a researcher at another institution and see if they can identify the item from photos of the amber. I have a large piece of amber with either an ?occulation? or something inside. Who do I contact to get help finding about it, if that is possible. Thank you, Melissa. I know what you mean about amber being mesmerizing. It certainly is fascinating when it contains preserved insects! I love Frankincense and Myrrh and burn it regularly. It has a terrific calming and soothing effect, I find. Amber is so beautiful, mesmerizing really. Especially when there are incredibly old insects encased inside. Fascinating. Thank you, sheilamarie78. I appreciate your comment. This is very interesting. I appreciate the research you've put into writing this hub. I just noticed you had the HOTD. Congratulations! Hi, RTalloni. Thanks for the congrats. It's definitely wonderful to learn about the fascinating world in which we live! Such an interesting read--thanks! Learning more about these resins is a reminder of what an amazing world we live in. It's a wonderful thing to live in times that allow for more intricate study of creation. Congrats on your Hub of the Day award! Thank you very much, Romeos Quill. I appreciate your visit and comment. It's very nice to meet you. Extract from Boswellia as a painkiller and the frankincense oil destroying bladder cancer cells - fascinating applications of this amazing tree and striking colours of your chosen resins. Thank you for the educational and felicitations on your achievement. Thank you very much for the comment and the congratulations, ologsinquito. Hi Alicia, congratuations on HOTD and thank you for explaining more about these precious resins. Thank you for the comment and the vote, poetryman6969. Voted up. I learned some cool things about resins. Thank you very much for the congratulations as well as the votes, the share and the pin, Patricia! I appreciate the angels very much, too, as I always do. It's very interesting to hear how people use plant resins. Congrats on HOTD....I thought I had read this and commented before but don't see it. This is such an interesting read, Alicia. We use oils including myrrh in some of our worship services and in special blessings for those who request it. The ant preserved in gum resin reminded me of Jurassic Park and the 'findings' discovered there. This is certainly deserving of the recognition you are receiving. Voted up++++ shared and Pinned to Awesome HubPages. Thanks so much for the comment and the congratulations, Heidi. I always appreciate your visits. Thank you, Thelma. I appreciate your comment and congratulations! Thank you very much for the comment and the congratulations, Peg. The resins are fascinating. They can be beautiful, too! Hi, GiftsByDiana. Thank you very much for the comment! I'm happy to meet you. Another super interesting hub... and a timely one, too, with the next Jurassic Park movie coming out. BIG congrats on Hub of the Day! Well deserved! What a very useful and informative hub! I enjoyed reading this. Congratulations on the HOTD! 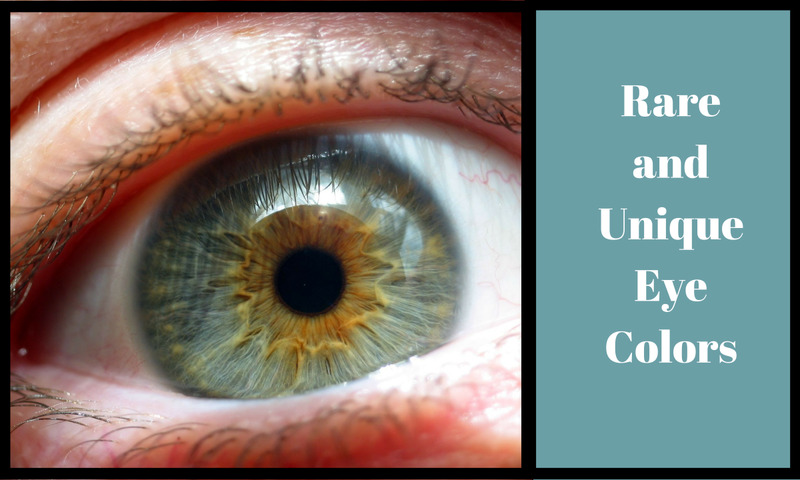 Fascinating information on these natural resins. I learned a lot here, especially about Frankincense of which I had heard but never knew exactly what it is. No wonder it was considered so valuable for thousands of years. Congratulations on a well deserved HOTD. More folks are finally starting to understand the natural systems and getting away from the artificial. Thank you for this page to help even more people learn how important this is. I use frankincense and myrrh quite often in my handmade products for my family and for my gift shop. Hi, tirelesstraveler. I've seen different brands of frankincense at both Whole Foods and Amazon, but I couldn't say which is the best brand. Amazon has frankincense from a range of companies as well as reviews for the different products, so that may be a good place to start your search. Where do you get good quality frankincense? Thank you very much, Anne. It's nice to meet you! Thank you very much for the kind comment and for sharing the interesting information, Alun. I appreciate the votes, too. It would certainly be absolutely fascinating to see a living dinosaur, even though there would be many points to consider before recreating it either completely or partially! An interesting and well illustrated page Alicia. Also a nicely laid out page - something which I think is very important in making a page visibly attractive and enjoyable to read. Frankincense and Myrrh and some of these other resins are familiar as names to all of us, but not so many know the fascinating stories behind them, so thanks for that. Re-Dinosaur DNA. I don't think it would be possible to obtain viable DNA from amber, but I know some scientists have been experimenting with selectively breeding and manipulating DNA in chickens to favour the more dinosaurian characteristics (DNA for tails, teeth etc, which birds still possess) and weeding out the more bird-like DNA, in the hope of eventually producing a creature which is at least dinosaur-like in appearance. Ethical or not? I don't know, but I definitely voted pro-dinosaur in your poll - I would give everything to see a real live, breathing dinosaur in the flesh!! Thank you very much for the lovely comment, tirelesstraveler! Truly well written and educational, your students are very lucky to have you for a teacher. Thank you so much for all the votes and the Facebook share, thelyricwriter! I appreciate your visit. Best wishes to you, too! Thank you for the comment, Dianna. I appreciate your visit! Fascinating information. I love the perfumes mixed with frankinscnse and myrrh, such a lovely fragrance. The amber is quite another educational read for me. Great post, as ususal. Hi, Jackie. Yes, I think earlier people were more familiar with the benefits of plant resins than many people are today! Thank you for the visit and the comment. I really enjoyed reading this. 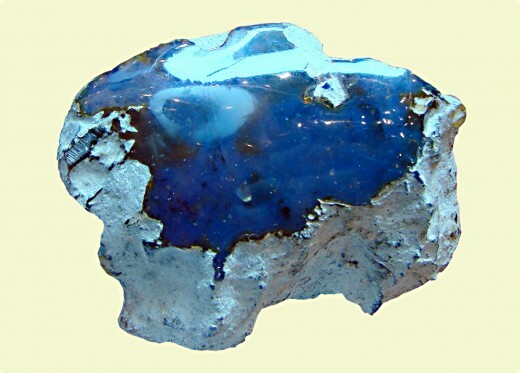 First I ever heard of blue amber too, lol, it is like saying blue yellow to me. I love amber. The wise men's gifts, wow, who would have thought? Perhaps they knew back then what they don't yet know today? Thank you so much, drbj! I appreciate your lovely comment and the vote. Bringing back a dinosaur could create problems. but it would certainly be fascinating to see one of these creatures! Wow, Alicia, what a fascinating read this is - kept me completely engrossed from beginning to end. I once purchased some amber jewelry in the Dominican Republic and now I know precisely how it may have been formed. And wouldn't that be a hoot if genuine dinosaur DNA could be extracted from these resins? Voted way up, m'dear. Hi, Bill. Thanks for the visit. I appreciate all your comments and support very much! Hi, Rolly. There are so many resins that are helpful for humans! Nature can be a great friend to us if we treat her well. Thank you very much for your comment and vote, and thanks for sharing the information, too. Hi Alicia... what an awesome read this has been and so very informative. 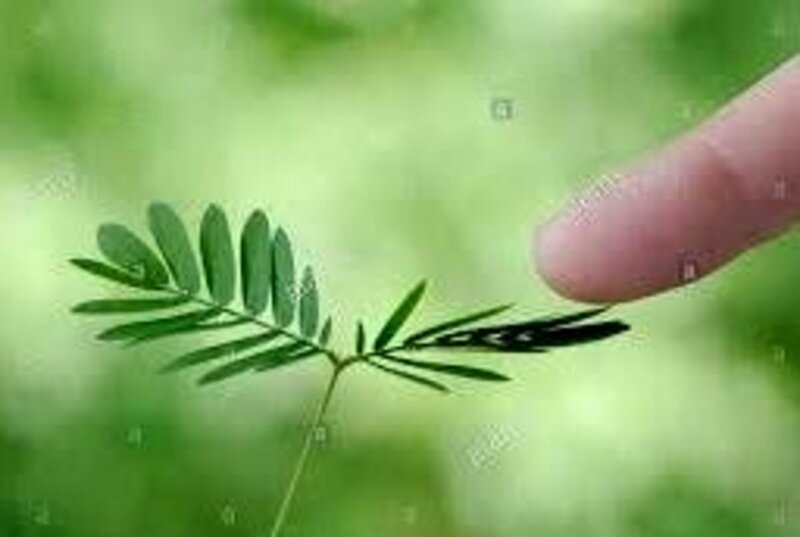 I have always been a great believer in nature and the medicinal it offers which are free for the taking. Thank you, Deb! Yes, plants are a great resource. They contain so many useful chemicals and materials. Many remarkable things are found within plants, as evidenced in your own research. The sky is the limit with numerous things, especially with many of the things in use today received from rubbers. Great work, Alicia! Thank you very much for the comment, DDE. I appreciate it! Thank you for the comment and the votes, Heidi. I love the thought of using frankincense oil at Christmas! I'll try that this year. I love frankincense! Have a bottle of the essential oil handy for aromatherapy. Always reminds me of Christmas. Lovely hub. Voted up & interesting! Hi, Christy. Thanks for the comment. It's nice to meet people from BC and around the world at HubPages! Thanks for the visit, Bill. I think that plant resins are very interesting to study, especially as many are useful for humans. Hi, FlourishAnyway. Apparently it's easy to contaminate samples with modern DNA, since it's in microbes and cells shed from the human body. I've read that the lab methods for detecting and analyzing DNA in the 1990s were less accurate than today's methods and were susceptible to giving inaccurate results, which may also have been a problem. I'm very interested in seeing what scientists discover as their tests become more accurate! Thanks for the comment and the votes. I finally understand what frankincense is! Thank-you for that. Also, nice to see another writer from BC! That was really interesting, Alicia. As a former science teacher I knew most of this, but you managed to slip in some info that I was not aware of, so thank you. This was an interesting read, very thought provoking with the idea that DNA may be found in old amber deposits. It's strange that several different scientists made the claim of finding it in the 1990s but that all of them involved contamination. Seems like basics of lab work may have been neglected, don't know. I liked your selection of photos. Beautiful. Voted up and more. Hi, Stephanie. Adding frankincense and myrrh to incense is a lovely idea! Thank you for the comment. I appreciate it! Thank you very much, tillsontitan! I appreciate your kind comment and the votes. Thank you very much for the comment, the votes and the share, Suzie! I think amber is beautiful, although I don't have any amber jewelry. I love the wide variety of plant resins that are available. Hi, Faith. I hope the Boswellia helps your husband. Frankincense and myrrh do have beautiful aromas. They are lovely resins for providing a pleasant scent. Thank you for the comment and the blessings! This is really great coverage of resins and types. I just started offering resins like frankincense and myrrh as part of my product line for incense. They are quite interesting to look at. One of the things I love about HP is the education I receive by reading hubs like yours! Of course I've heard of frankincense and Myrrh but actually knew little about them. This was very interesting and so well written it was easy to follow through. What an interesting article and full of facts I did not know. I love Frankincense and Myrrh and have some several skin care recipes with it. Such a precious oil with a great history. Amber jewelry I have and love the different colors available. Thanks for another well penned article with great info! This is a fascinating read here. We have used anointing oil with the Myrrh and such and also in candles for a beautiful fragrance during worship. My husband has arthritis in his knee and he takes the supplement Boswellia. I do not believe I would want the dinosaurs to be brought back this day! Excellent and informative hub as always. Thank you very much for the comment, Wallace! I appreciate your visit. A very well written post and informative as well. 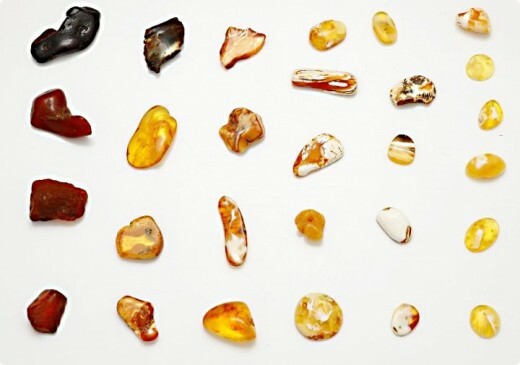 I have worked with amber and many resins in my life and thought no more than it as a substance to be used by man in his tools and in production of chemicals used to beautify his surroundings. And smell nice.